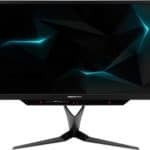 Apart from announcing the ground-breaking 4K 144Hz G-Sync HDR gaming monitor, Acer has announced another revolutionary gaming monitor that will also feature Tobii eye tracking technology, the Acer Predator Z271UV. Additionally, this model features a curved screen with overclockable refresh rate to 165Hz, Nvidia G-Sync, 1ms response time, and 178-degree viewing angles. That’s right, the Acer Predator Z271UV combines the best of both worlds and delivers the ultimate gaming experience with both flawless viewing angles and rapid response time speed. 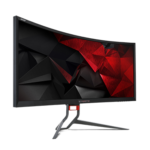 As you can see, the Acer Predator Z271UV 165Hz gaming monitor ticks so many boxes, it’s difficult to determine which feature to write about first. There’s no official confirmation regarding the panel type but based on the given information about the 178-degree viewing angles and 1ms response time speed (3ms native) we presume it will most likely feature an IPS panel. In order to increase the speed of the response time, Acer will probably be using a technology similar to LG’s Motion Blur Reduction. The other possibility is a VA panel that uses the MPRT (Movie Picture Response Time) technology, like the Samsung CFG70. Regardless of the actual panel type, the Acer Predator Z271UV will certainly revolutionize the gameplay experience due to the combination of fast response time, flawless viewing angles, a buttery smooth performance, and a vibrant image quality thanks to the quantum dots. The quantum-dot technology broadens the color gamut to up to 130% of the sRGB color space for more vibrant color quality and lifelike image. In addition to the rich pixel density of 109 pixels per inch of the crisp 1440p resolution on a 27-inch monitor, the overall image quality is promising fascination. For the smoothest experience possible, Nvidia G-Sync allows you to synchronize your compatible Nvidia graphics card to the Acer Predator Z271UV monitor and thus gain a dynamic refresh rate within which screen tearing and stuttering are eliminated while the input lag is reduced. If you have no issues with the fluctuation of FPS (Frames Per Second), you can enable the ULMB feature instead which further decreases the motion blur of the fast moving objects in the fast-paced video games. In addition to the refresh rate that’s overclockable to 165Hz, your enemies don’t stand a chance. As if it weren’t enough, the Acer Predator Z271UV G-Sync monitor also comes with the built-in Tobii eye tracking technology. Essentially, this feature consists of an integrated camera that tracks the movements of your eyes and helps you aim and avoid objects in supported video games. In combination with all the key features for a smooth performance, stunning image quality, and steep 1800R screen curvature, the Tobii eye tracking takes gaming to another level with an immersive and intuitive gameplay experience. Naturally, the Acer Predator Z271UV display will also have all the common features from the Predator series. These include the custom crosshair overlays, on-screen timer, FPS counter, customizable gaming presets, and the Dark Boost feature for increased visibility in the dark scenes. Additionally, other features include the low blue light filter, flicker-free screen, and low dimming technique which allow you to enjoy watching the screen for hours to an end without straining your eyes. 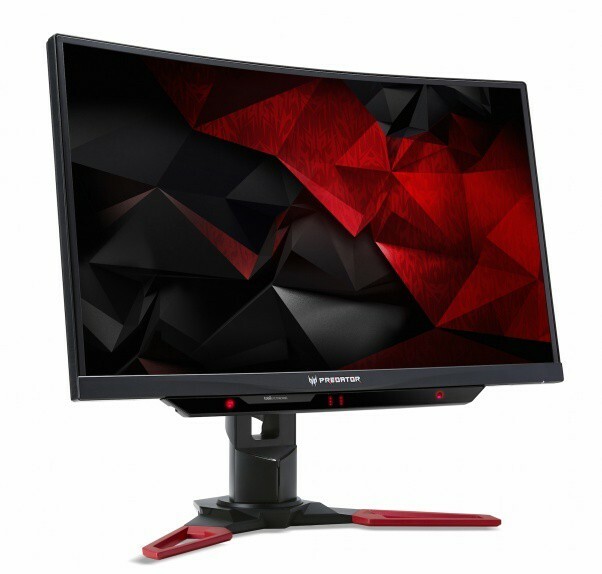 The appearance of the Acer Predator Z271UV includes the ZeroFrame design with thin bezels and plenty ergonomic functionalities such as -5, 25 degrees tilt, +/- 30 degrees swivel, and up to 4.7-inches height adjustment. The deep 1800R curvature along with the narrow bezels make for an immersive and cinematic viewing experience as you don’t have to move your eyes as much which is ideal for the Tobii eye tracking camera. The connector ports include an HDMI, a DisplayPort, an audio line-out, and four USB 3.0 ports. 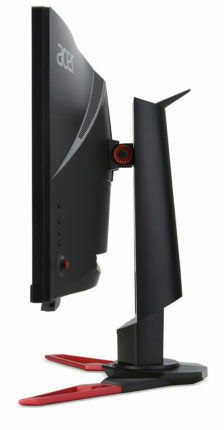 Additionally, the monitor features 2x7W built-in speakers dubbed as the Acer TrueHarmony for total multimedia entertainment. The Acer Predator Z271UV release date and price are unknown at the moment (May 2017). Presumably, it will be considerably cheaper than the revolutionary 144Hz 4K HDR model which may cause it to be more popular due to the computer requirements for running 4K resolution at 144Hz. In fact, the Acer Predator Z271UV will offer cutting edge game play experience thanks to its innovative 1ms response time speed along with the 178-degree viewing angles and enhanced image quality by the quantum dots. To top it all of, there’s Nvidia G-Sync and the whopping 165Hz refresh rate for a fluid performance while the Tobii eye tracking and 1800R curvature allow you to fully immersive into the gaming world. Lastly, the design has no flaws and offers plenty of ergonomic support. 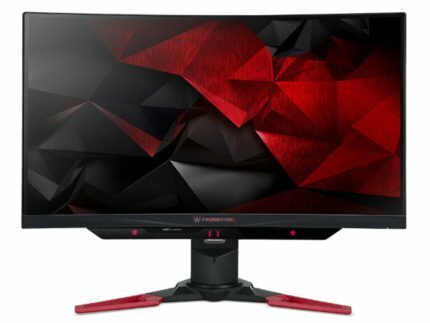 All in all, if the Acer Predator Z271UV price doesn’t shock us, it will be the perfect dream monitor until the 144Hz 4K becomes more affordable and available. The Acer Predator Z271UV features a revolutionary 1ms response time speed with 178-degree viewing angles combination which along the 165Hz refresh rate and Nvidia G-Sync make for the dream monitor. Moreover, it features a beauteous and ergonomic design as well as the built-in Tobii eye tracking technology which in addition to the curved screen delivers a stunningly immersive gameplay experience.